This year, we will be hosting a Ladies Offroad Experience in addition to offering two Ladies Offroad Trail Training sessions! 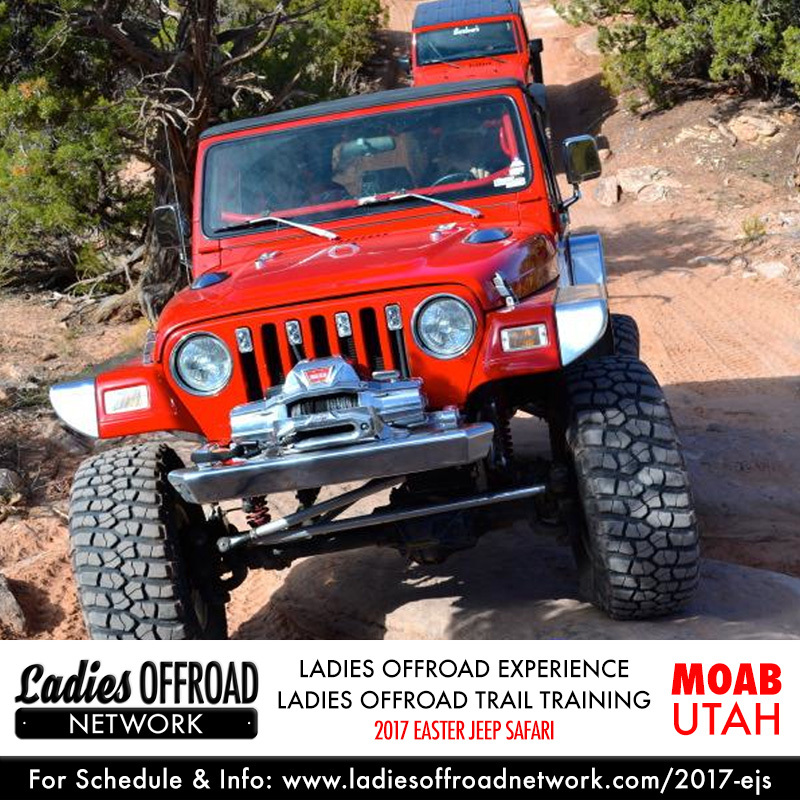 Every lady in Moab should stop by our Tuesday Ladies Offroad Network Social to meet other women that have the same interests. A casual environment where you can stop by and meet the ladies at Easter Jeep Safari. Swap stories about wheeling, your travel experience to EJS or anything that comes to mind. We all have a lot in common, it just takes a few minutes to open up and we will all be laughing. There will be multiple activities that ladies can participate in if they would like. 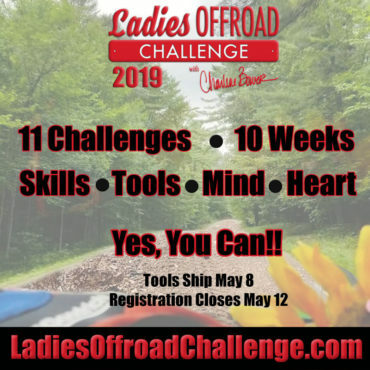 At 6pm sharp, Charlene Bower will make big announcements about the 2017 Ladies Offroad Challenge and other events that have been planned. 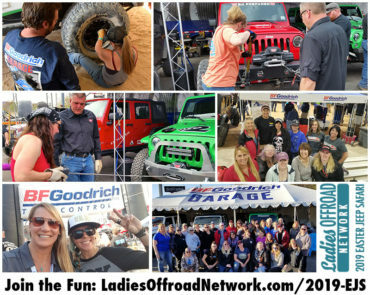 Throughout the early evening ladies can change a BFGoodrich Tire on Frankie, the Jeep Charlene Bower used in the Ladies Co-Driver Challenge Trail of Missions and Rebelle Rally events. WARN Winches will be giving ladies the opportunity to pull a winch line out and reel the line back in. Hi-Lift Jacks will be there to give ladies the chance to experience the correct way to use a Hi-Lift. Jessi Combs will be in attendance with her King of the Hammers race car signing autographs. The online version of the BFGoodrich Garage will be set up looking for you to tell your story. There will be snacks and water available, byob. We will finish the evening with a large raffle for I’m Not Just a Girl shirts, BFGoodrich Tires, WARN, and other goodies. 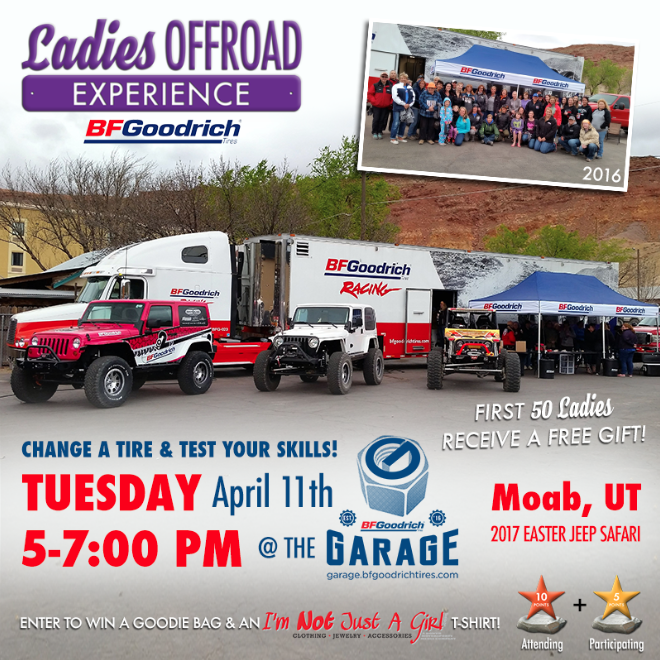 The first 50 ladies to arrive will receive a special gift compliment of BFGoodrich Tires! 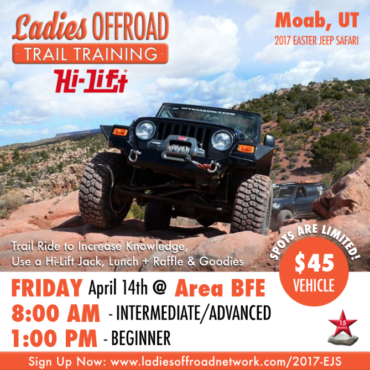 Lady experienced drivers, or those wanting to drive for the first time, should take advantage of the Ladies Offroad Trail Training partnered with Hi-Lift at AreaBFE on Friday led by I4WDTA pre-certified trainer Charlene Bower. Register for either the morning Advanced/Intermediate or the afternoons Beginner run. We have arranged it so both groups will share lunch together and be able to meet and encourage each other. This experience is a great opportunity to wheel with other ladies and learn new skills including having hands-on training with a Hi-Lift Jack. Compliments of Hi-Lift, there will be a drawing for one Hi-Lift Jack for each trail group. * Registrants must support at minimum one of the above mentioned partners in product choice. Run BFG Tires, Raceline Wheels or WARN Winch. Have Mac’s Tie Downs or own a AEV Conversion vehicle or products. * By registering here, you are NOT guaranteed a spot at the event. You will be asked to submit a photo of your vehicle and complete a short questionnaire with vehicle info, experience, and names of all guests. We are limited to the number of guests per trail group. You will be contacted by Bower Media and confirmed a spot individually. Experience trails with some of the most professional drivers in the industry, be showered with gifts and food, and then hob-nob with them and other industry partners at a dinner party with a raffle prize valued at $8,000! BFGoodrich Tires™, Raceline Wheels, Warn Industries, American Expedition Vehicles and Mac’s Tie Downs have partnered to host the 4th Annual Gathering in Moab. 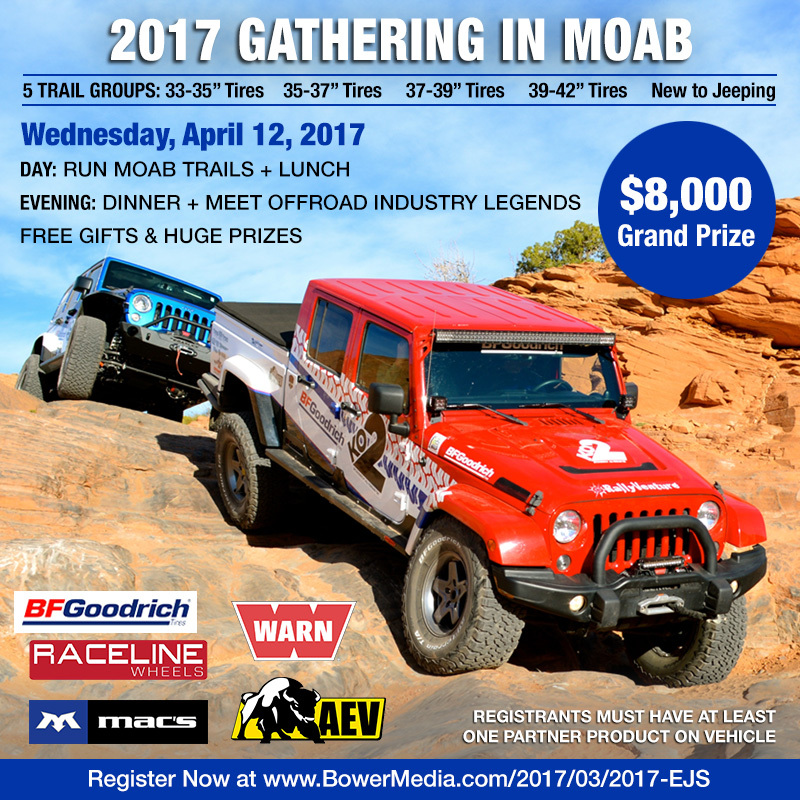 This unique event hosts guests from across the country who will join exceptional trail leaders for a day on the Moab trails followed by an evening at an iconic Moab location for dinner with industry professionals. Guests at all levels of ability are welcome to register, from the buggies on 42” BFGoodrich Tires to the stock Jeep with a beginner driver, with a minimum of one partner product on their vehicle. Register at http://bit.ly/2oqDGAU. Guests will not only be treated to snacks, lunch and dinner, but also multiple gifts and a large evening raffle. The raffle will consist of many great items throughout the night for all evening guests, but when it comes time to draw for the Grand Prize Raffle, only the 75 registered guests will be included. The $8,000 Grand Prize package will include a set of 5 BFGoodrich KO2 All-Terrain Tires, a set of 5 Raceline Wheels, a WARN VR8000-s Winch, an AEV Conversions $750 Gift Certificate and a Mac’s Tie Downs Ultra Pack with Chain Extensions. At the end of the day, you are guaranteed to leave with a bag full of goodies and a lifetime of memories to share. The day will consist of a morning trail ride after meeting with the leaders of the partnering companies. The trail ride group will be of the guests choosing, based on tire size and ability. Group leaders include Poison Spyder's Larry McRae, Pirate4x4's Lance Clifford, Impulse Offroad John Williams, Warn Industries Chad Schroll, and Bower Media's Charlene Bower. The experienced team will be available to help you navigate your vehicle through the simplest to the toughest terrain that you feel comfortable with. We encourage you to learn from your trail leaders, they are here to help you become a better wheeler. The trail leaders will bring you back to the main group area for a late lunch. Your afternoon is flexible to take on another AreaBFE trail, or head back to town in preparation for the evening. At 6pm, we will reconvene at an iconic location just south of town in a backyard garage where the walls are packed with history of the 4-wheel drive industry. Being able to say you have been here is something many dream about, and usually only industry folks have the opportunity to fulfill. Many friends of the brands will be in attendance at this evening dinner. You will be rubbing shoulders with the off-road media and leaders of some core companies. We encourage everyone to stick a hand out and introduce yourself to the person next to you. We guarantee you will have an interesting conversation! There are limited guest spots available. To register, go to www.bowermediastore.com/product_p/bfg-ejs17.htm. You will receive a response with a request to complete a form and submit a photo of your vehicle. After that submission, you will receive a confirmation with the detailed schedule of the day and meeting locations.